The Igbinedion family on Friday held a special memorial service in honour of their departed son, Osaratin Igbinedion who died in car accident last month in the United States. The memorial service which held in Abuja and was aired LIVE on major television stations including AIT had in attendance the father of the deceased and former Governor of Edo State, Chief Lucky Igbinedion, his wife Eki, siblings and other family members. 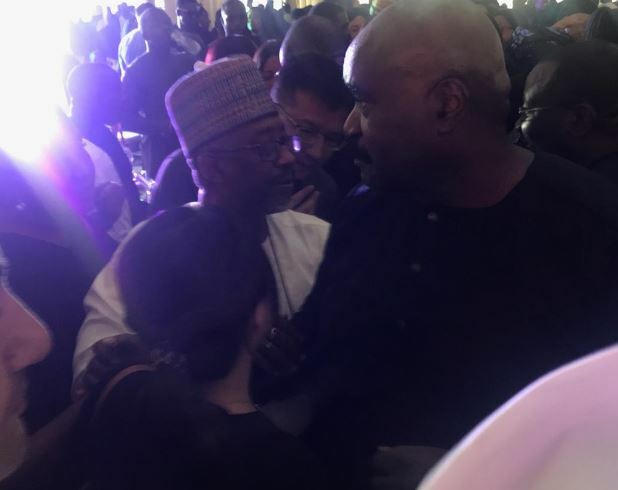 All decked in black, friends of the deceased’s father, including publisher of TheNewsGuru.com (TNG), Mideno Bayagbon; former governor of Delta State, James Ibori; the immediate past chairman of the ruling All Progressives Congress (APC), John Odiegie-Oyegun; former governor of Kano State, Rabiu Kwakwanso; former governor of Anambra State and Vice Presidential candidate of the Peoples Democratic Party (PDP), Peter Obi; former governor of Akwa Ibom State, Obong Victor Attah; former governor of Cross River State, Liyel Imoke; former Minister of External Affairs and chieftain of the Peoples Democratic Party (PDP), Tom Ikimi and a host of other political and social gladiators graced the memorial. Tributes were rendered by the immediate family members and friends of the deceased. According to them, the late Osaretin though lived a short life, positively touched people around him. “Whenever he comes around is the best time for us. He has a way of electrifying the entire house. We can’t describe how much we’ll miss him,” one of Osaretin’s sibling said tearfully. The late Osaretin was the second son of Chief Lucky Igbinedion. He died in a ghastly motor accident with his nephew, Esosa Onyemwense, in the United States around 3:00 am on Saturday, February 16. On the fateful, Osaretin, accompanied by his cousin, Esosa, in his car ran into an 18-wheeler vehicle, and both of them died in the auto crash. The sad development had brought torrent of condolences to the Igbinedion family, who had since been thrown into mourning. Osaretin, who schooled abroad, graduated at the University of Pittsburgh’s College of Business Administration with a degree in marketing, with a minor in economics. He later acquired a Masters degree in International Management from the Northeastern University. He was aged 23 and has since been buried.